The gothic façade you step through upon entering The Glasshouse would not exist, without the patronage of Willielma Campbell, also known as the Viscountess Glenorchy. Born in nearby Galloway in 1741, Willielma’s life changed when recovering from an illness in 1765. Under the care of the sister of Rowland Hill, the renowned English preacher, she experienced a religious conversion. Following her husband’s death in 1771, Willielma dedicated the remainder of her life, and vast fortune, to furthering evangelical causes, particularly in Scotland. 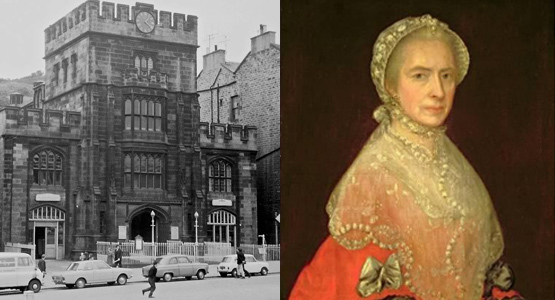 Not only did she hold evangelistic services in her own Edinburgh home for both the rich and poor, she also established several chapels in Scotland and England, dedicated to providing the poor of their respective cities, a dedicated place of worship. Lady Glenorchy herself died in 1786, with no surviving children. To ensure her legacy, and the chapels she had gifted to their communities were still able to flourish, she left the bulk of her £30,000 estate to her chapels. The congregation who worshipped at what is now The Glasshouse, now take service at the nearby Greenside Church, whilst the impressive frontage of the old Lady Glenorchy church has been retained and given a new life as The Glasshouse Hotel.